Boston 1775: “How the Cambridge Alarm Led to the Concord Fight,” in Cambridge, 20 Oct.
Laurie Halse Anderson in Wellesley, 18 Oct.
Why Is Boston Still the Capital of Massachusetts? Open House at Wright Tavern in Concord, 15 Oct. Ran Away from the Regiment? “The Arms Race of 1774” in Worcester, 4 Oct.
“How the Cambridge Alarm Led to the Concord Fight,” in Cambridge, 20 Oct.
Last March I spoke at Longfellow House–Washington’s Headquarters National Historic Site about “The End of Tory Row.” That talk was about that Cambridge neighborhood in the early 1770s, defined by one extended family of wealthy Anglican sugar-plantation owners. Their comfortable community came to an abrupt end on 2 Sept 1774. 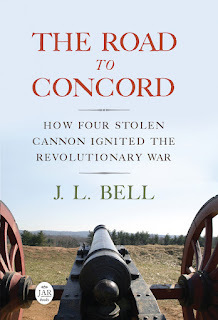 On Thursday, 20 October, I’m returning to the Longfellow–Washington site to tell the next chapter of that story: “How the Cambridge Alarm Led to the Concord Fight.” Like the story of the “Tory Row” neighborhood, that narrative also involves extended family networks. The Road to Concord includes a dive into the family of young Samuel Gore, including his brothers-in-law Thomas Crafts and Moses Grant, to see why they became ready to rebel. But there are other families I could have traced out the same way. Let’s take George Trott (1741-1780), a jeweler and goldsmith in Boston. Trott and Crafts were both members of the “Loyall Nine” who organized the public protests against the Stamp Act in 1765. Trott became the second-in-command of the train, Boston’s militia artillery company, while Crafts was the third-ranking officer. By early 1775 those four brass cannon had been smuggled out of Boston to Lemuel Robinson’s tavern in Dorchester. Robinson (1736-1776) was an obvious choice to hide those guns. He was the captain of the militia artillery company for Suffolk County outside Boston, and he was active in the Whig movement. He put Liberty Tree on his tavern sign and hosted Boston’s Sons of Liberty at a big dinner in 1769. Was there a family connection between Trott and Robinson? Robinson was raised in Dorchester by his maternal grandfather, Thomas Trott (1685-1762). George Trott’s father was also named Thomas Trott (1705-), a blacksmith of Boston. Genealogists have had trouble sorting out or connecting those families, though. My talk at the Longfellow–Washington site, 105 Brattle Street in Cambridge, starts at 6:30 P.M. (Stretches of Brattle Street open up for free parking at 6:00.) We’ll have copies of The Road to Concord for sale and signing afterward. To reserve seats in the carriage house, please call (617) 876-4491 or email reservationsat105@gmail.com. There is a book entitled, 'The Treat Family: a genealogy of Trott, Tratt, and Treat for 15 Generations" that mentions a Thomas Trott living in Dorchester between 1644 and 1698. He had a wife named Susan and several children. Perhaps George Trott is somehow related to Thomas, who in turn is a descendant of either Matthias or Richard Treat, Richard being the father of Robert Treat, governor of Connecticut. Just a theory, as records for the Treats/Trotts are incomplete for this time period.